The United Kingdom goes to the polls in about two weeks’ time [23 June 2016] to determine whether to remain in the European Union or to leave. And as Britain debates its European identity, and as England debates its English identity, I have found myself right in the middle of England. I am spending these three days at a conference in the Hayes Conference Centre in Swanwick, near Alfreton, and I am less than two miles from Ripley, the Derbyshire town that was recently named by the Guardian as the “most English town” in England. I passed by Ripley earlier in the day on my journey between Lichfield and Alfreton. According to the Guardian, a study by the University College London – admittedly carried out a decade ago – found that Ripley was the “most English” place in England. The weekend feature, published on Saint George’s Day [23 April 2016], said Ripley is “smack bang in the middle of the country,” and has the highest proportion of residents with English ethnic origins – 88.6% – with nearby Heanor, also in the Amber Valley district of Derbyshire, not far behind. The nearest train station to Ripley is 10 minutes away at Alfreton, where I arrived this afternoon. From there, there are half-hourly trains to Sheffield (30 minutes) and Nottingham (20-30 minutes), and Ripley is 15 minutes to the M1, and half an hour from the Peak District, Nottingham and Derby. There is something in summer that makes the English countryside unique and impossible to match. I stayed overnight in the Hedgehog Vintage Inn, on the northern fringes of Lichfield, with a room looking out over the rolling countryside of South Staffordshire. I am on my way to the residential meeting of the trustees and council of the Anglican mission agency USPG in Swanwick, Derbyshire, and after attending the Cathedral Eucharist in Lichfield Cathedral on Sunday morning [5 June 2016] I decided to take a long walk through the countryside between Lichfield and Tamworth. It might be wrong to even describe Comberford as a village. It has no shop, it has no post office, it has no pub, and the small church was closed a few years ago to the dismay of many of the people who live in Comberford. But this place has the feeling of ancestral heartland, and its landscape has called out to generations of my family, even if there have been misunderstandings in the past about the family’s origins and where the family came from. I first visited Comberford almost 50 years ago, in 1970. But there is no reason for outsiders to want to visit Comberford. It is rural England at its best, but it is nowhere. The road north from Tamworth leads on to Elford and Burton on Trent, but you have to want to go to Comberford to get there. And even then, the directions can be distracting. The first indication – although there is no signpost – that you have reached Comberford is the driveway leading up to Comberford Hall, the ancestral home of the Comberford family that my great-grandfather visited over a century ago, while the Peel family were living there. Today, Comberford Hall is gated and inaccessible. The few neighbouring houses clustered around it are part of a centuries-old complex, but they are isolated from the rest of the village. About half a mile further north, a smallsign indicates that Comberford itself is a little to the west off the main road, squeezed between the road to Elford on one hand, and the railway line and the River Tame on the other. In the beautiful, warm, sunny, Sunday afternoon sunshine, I made my way down Tollgate Lane to Comberford itself. It is such a small part of Lichfield District that it is not an administrative unit in itself – it is a part of Wigginton and Hopwas. On Sunday afternoon, people were out washing their cars, cutting their lawns, or basking in the sunshine. After walking around the deserted and desolate abandoned Church of Saint Mary and Saint George, and spending a little time in Comberford Millennium Green, I walked to the end of Manor Lane, where Comberford Manor farmhouse may be the original heart of the Comberford estate, and still stands at the centre of the principal farming activities in Comberford. The house looks out onto fields and farmland, with the railway line and the River Tame within view. One of the unique aspects of the countryside in England is the way in which footpaths are marked out for the rambler, the stroller and the walker. I walked through acre after acre of green and yellow countryside, along clearly marked footpaths, without meeting anyone. There was no-one to ask me my name, who I was, or what I was doing walking through this green-and-gold open countryside. I have walked through this landscape countless times since I was a teenager. And on Sunday afternoon the only sounds I could hear were birdsong and trains in the distance running between Tamworth and Lichfield Trent Valley. Many years ago, I was pointed to a depression in a field, and told that this was the site of the original Comberford Hall. But people who grew up in Comberford in the 1950s and 1960s believe this was caused by a stray bomb in earlier decades. I now think that Comberford Manor is probably the original site of Comberford Hall, and that the village has grown up over the centuries around the site of the original settlement. It was hard to leave such inviting terrain. 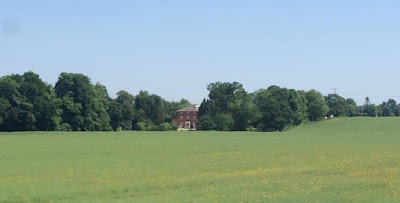 Eventually, I walked back down the drive at Comberford Hall, and walked along the main road, past Orchard Cottage and back to Tollgate Lane, half a mile from Comberford village. There is something in the soul and the heart that calls us back not just to ancestral places with their buildings and the houses with which we share names, but to the soil itself, the open fields, the trees and shrubs and the landscape. And it is easier to answer that call when the sun is shining and we return weather-beaten from the very soil that nurtured our ancestors. While I was researching my recent blog postings about Philip Larkin and the poems he wrote in Lichfield, I found myself on Station Road for the first time in many years, and for the first time noticed the small, redbrick Christadelphian Hall. I have only ever known one former Christadelphian, and I started asking myself who are the Christadelphians, are they Christians, and when did they first come to Lichfield. As a cathedral city, most visitors to Lichfield think of Lichfield Cathedral when it comes to thinking about places of worship, and was there this morning for the Choral Eucharist. But there are other Anglican churches throughout the city that are places of historical and liturgical interest, including Saint Mary’s, Saint Chad’s, Saint Michael’s, Christ Church and the chapel of Saint John’s Hospital. Lichfield has a number of churches representing other traditions too. There are two Roman Catholic churches that form one parish in Lichfield: Holy Cross Church on Upper Saint John Street and Saint Peter’s and Saint Paul’s Church on Dimbles Hill. The Quaker George Fox first visited Lichfield in 1651.In 1672, five houses in Lichfield were licensed for Presbyterian worship. The Congregationalists met in Tunstalls Yard in 1790, grew into the United Reformed Church in Wade Street, which is now both a United Reform and Baptist church. Although John Wesley visited the Lichfield area in 1755 and 1756, and again in 1777, he did not preach here. A Wesleyan chapel in Lombard Street was registered in 1813 and was built in 1814 or 1815. A new chapel opened in Tamworth Street in 1892. The former chapel was in Lombard Street was 1980 sold it to the Jehovah’s Witnesses to use as their Kingdom Hall in 1980. There was another Wesleyan chapel in Wade Street from about 1815, and from 1826 the New Connexion Methodists used a chapel in Sandford Street that had been used previously by the Congregationalists. They later moved to Queen Street but their chapel was sold in 1859, the congregation having disbanded. The Primitive Methodists also had a chapel in George Lane. This closed in 1934 and was a Salvation Army hall for some years. A Pentecostalist church met in 1961-1969 in George Lane until 1969, when the Emmanuel Pentecostal church opened in Netherstowe. It later became the Emmanuel Christian Centre, and is now known as the Life Church. On the fringes or the edges of Christianity, the Jehovah’s Witnesses have met in Lichfield since at least 1956, and now have their Kingdom Hall in the former Methodist chapel on Lombard Street. They are a familiar site with the their stalls on the corner of the Market Place or on the sidestreets leading to the bus station. There has been a Mormon or Latter Day Saint presence in Lichfield since 1861, when they had a meeting room in Sandford Street. The present Mormon church in Purcell Avenue was registered in 1972, and from 1972 to 1977, the Mormons’ English headquarters was in Lichfield. However, the one of the less well-known groups in Lichfield may be the Christadelphians, with their small ‘ecclesia’ or church on Station Road, which blends in with the neighbouring redbrick houses and goes almost unnoticed by many despite its proximity to the centre of Lichfield. The story of the Christadelphian presence in Lichfield dates back almost a century and a half to 1870, when the recently appointed headmistress of Saint Chad’s School on Beacon Street was forced to resign because of her Christadelphian beliefs. A few years later, Thomas Sykes, who had formed a small Christadelphian community at Bourton on the Water in Gloucestershire, moved to Lichfield in 1874. By 1885 eight Christadelphians were meeting in each other’s houses, and in 1890 a meeting room was opened above Thomas Sykes’s shop in Tamworth Street. In 1902, the Vicar of Saint Mary’s, Canon CN Bolton, denounced the Christadelphians as heretical. At the subsequent public meeting, the Christadelphians of Lichfield defended their beliefs. Their numbers increased, and from 1903 meetings were held in Saint James’s Hall in Bore Street. After Saint James’s Hall was converted into a cinema in 1912, the group of over 40 Christadelphians in Lichfield built their own hall in Station Road. It opened in 1914 and extended in 1959. The Christadelphians still meet there on Sundays to this day. There are over 300 Christadelphian ecclesias in Britain and Ireland, and there are about 50,000 Christadelphians around the world. They resist calling their buildings churches, they are not part of Churches Together in Lichfield or other ecumenical groups, and some people ask whether they are Christians. Christadelphians differ from mainstream Christianity in a number of doctrinal areas. They reject the Trinity and deny the immortality of the soul, believing these to be corruptions of original Christian teaching. Many of them are pacifists, and they generally avoid taking part in politics, the police and the army. They held their most recent conference last week in the Hayes Conference Centre in Swanwick, Derbyshire, and coincidentally I am travelling there from Lichfield later today for the annual residential meeting of the trustees and council members of the Anglican mission agency USPG. Christadelphian congregations traditionally use the name ‘ecclesia,’ from the New Testament Greek ekklesia (ἐκκλησία), meaning assembly or church, and they resist using the word ‘church’ because of its association with mainstream Christianity. To this day the Christadelphian building on Station Road in Lichfield, which I noticed on a recent sunny afternoon, is known as the Christadelphian Hall or ecclesia.